Can you have a smart home without smart appliances? Belkin thinks not, and it’s convinced Jarden—the company that markets home appliances under the Mr. Coffee, Crock-Pot, and Holmes brands—that people who live in smart homes agree. Well, I live in a smart home, and a coffee maker would need to be more than intelligent to impress me. It would need wheels and a robot arm, too. 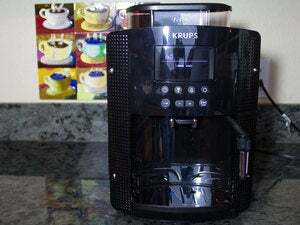 You see, programmable drip coffee makers have been around about as long as—well, as long as drip coffee makers. I buy one every third time I replace my worn-out machine. And I berate myself a couple of weeks later for wasting my money. Because no matter how programmable it might be, I still need to fill the reservoir with water, grind the beans, replace the filter in the basket, and dump in the grounds. Call me lazy, but I just can’t muster the motivation to do that the night before I want a cup of mud, even though it would make my day easier. Show me a coffee maker that can do all that and cost less than $300, and I’ll call it a breakthrough. You can manage the WeMo-enabled Mr. Coffee using your smartphone, but it won't interact with other WeMo devices. But I’ll be darned if I didn’t find myself thinking it would be different with this coffee maker. A graphical user interface on a color display is easier to use than any number of buttons and a text-only display on an appliance. The well-designed WeMo app for Mr. Coffee (available for Android and iOS devices) makes it super-easy to program a brewing schedule (although you’re limited to one cycle per day). You don’t have to stick to a schedule, though. If you want to sleep in on Saturday morning, you can kick off the brewing cycle without getting out of bed—provided your phone is in reach and you filled Mr. Coffee with water and grounds the night before. Mr. Coffee will let you know when it needs something. The app knows when the water reservoir is empty and whether the carafe is in place beneath the coffee maker’s hot-water outlet, and it will send you a reminder at 8PM if you’ve programmed it to make coffee by 11AM the next morning. It won’t report the status of the grounds, though, so you’ll need to check that when you add the water. The WeMo app will also send you messages when the coffee finishes brewing, and it will remind you to perform important maintenance, such as replacing its water filter and descaling its brewing mechanism after every 90 brews. For me, that’s probably more valuable than scheduling brew cycles. I’m pretty good about remembering to change the water filter in my pots, but the only time I think about descaling them is when I’m wondering why they suddenly stopped working. 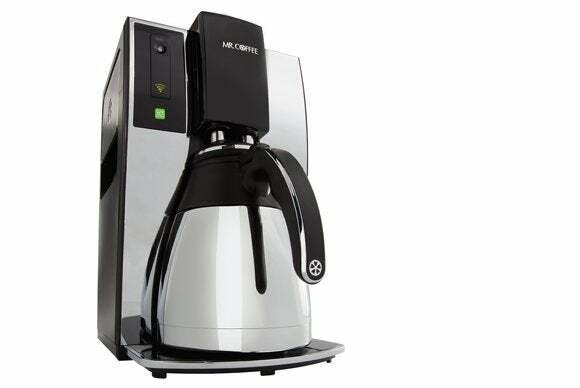 This Mr. Coffee has a couple of clever features that have nothing to do with its electronics. First, you can remove its water reservoir and take it to the faucet (the filtered water dispenser on the fridge in my case) and fill it directly.That’s a heckuva lot more convenient than filling the carafe and then pouring the water from the carafe into the reservoir. Second, the carafe is a stainless-steel vacuum flask (aka a Thermos). So not only will it never break, but there’s no heating element to inexorably burn the rest of the coffee while you’re savoring that first cup. Fortunately for me, I need to get up at 3:00 AM only on Mondays. On the downside, Mr. Coffee persists in using a basket instead of a cone to brew its coffee. A cone evenly exposes the grounds to water to extract more flavor. A basket has much more surface area, so even those with shower-head emitters can’t wet the grounds as evenly. This Mr. Coffee made a flavorful cup, but its coffee wasn’t as robust as I prefer, even when I loaded the basket with fresh-ground French roast. Mr. Coffee connects to your Wi-Fi router, but it can’t interact with anything else in the WeMo ecosystem (light switches, smart plugs, light bulbs, and so on). You could have Mr. Coffee start its brewing cycle and your WeMo-compatible LED light bulbs gradually brighten when your alarm goes off, but you’d need to program the three events independently. 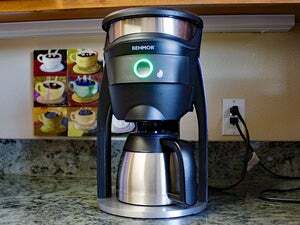 Mr. Coffee doesn’t support IFTTT integration, either; so if you were thinking of having it start its brew cycle when a WeMo motion sensor detects your entrance to the kitchen in the morning, forget about it. If Mr. Coffee made a better cup of coffee, the ability to program it from my smartphone and have it send text messages about its status would be good enough for me. If you don’t like your coffee strong enough to strip paint, it might be good enough for you, too. The WeMo-enabled Mr. Coffe Smart Coffeemaker has some great features, but I'd like it a lot better if it made a better cup of coffee.